Grace Coolidge had already made an impact on the American public as a glamorous spouse of the Vice President. When she became First Lady at the age of 44, she was already intriguing to the public. Since she did not give interviews to the press, her public silence only enhanced her mystery and glamour. Because her husband was often perceived as non-talkative, she was the outgoing one who impressed visitors and dignitaries in a joyous White House. However, two deaths marked this presidency. The death of President Warren Harding, in 1923, brought a sudden presidency to the then Vice President Coolidge and the death of their son, Calvin, Jr., in 1924, cast a pallor over the many successes the two did have in their time as First Couple. Andrew Goodhue became an electrical engineer after an apprenticeship in Nashua, NH. In 1870,he married Lemira Barrett and they moved to Burlington, Vermont where he had a job waiting at Gates Cotton Mill. They lived at 315 St. Paul Street in mill housing; after nine years, Grace was born. Her parents bought a home on lower Maple Street and, when Grace was two years old, they relocated. As an only child, Grace was part of her parent’s circle. With few playmates, she appreciated visits to her grandparents, Benjamin and Caroline, and with three uncles and two aunts the house in Hancock, NH, was filled with nine grandchildren. An early memory for Grace was that of an injury to her father at the mill. Despite the fact that she was only four years old, she remembered that a knot in the wood he was cutting at the mill flew out and struck his face so that bones of his nose and jaw were broken and his eye muscles were injured. Since her father needed a quiet recovery, Grace was sent to live with Mrs. John Lyman Yale and her family. Grace grew to love this family. They were the ones who introduced Grace to children with hearing impairment. Burlington was a small city with excellent schools. Grace credited them with giving her an excellent education and lively social life. She had the opportunity to hear fine music in such a worldly city. Her family must have encouraged this and even hired an elocutionist for Grace’s music lessons. Her musical education included grammar school piano lessons. Religion was part of Grace’s youth. At sixteen, she decided to become a member of the Congregational Church and change her affiliation from the methodist church where her parents worshipped. This showed a leadership streak in that she made the decision and other family members followed her. Her parents soon joined her in her new church home and her father made many a repair to the organ or furnace as a deacon. Andrew Goodhue formed a business partnership with William H. Lange and bought a machine shop. Only a year later, 1887, her father was appointed Inspector of Boilers of Steam Vessels for Lake Champlain. In 1898, his shop was sold and he continued as Inspector of Steam Vessels until 1920. Grace also remembered steam heat and electricity being installed in her home in her early years. These modern conveniences were noted by her in her Autobiography since they changed and softened the hardships of daily life. Grace graduated from high school in 1897 and even though the female population was small at the University of Vermont, she assumed she would attend. She did take a year off before going to college for health reasons (she had curvature of the spine and needed exercise to overcome it) and lived with her aunt, Alice H. Goodhue, widow of Dr. Perley E. Goodhue. Her father built a new home up the hill at 312 Maple Street and she lived there with her family during college. When Grace entered college, she was five feet four inches tall and considered herself to be plump. She had thick curly black hair, grey-green eyes and a generous mouth. She liked her life at college. She enjoyed sleigh rides in winter and theater productions. She did join with thirteen other women to petition Pi Beta Phi, a national fraternity, for a charter at the University of Vermont. The group was successful and they met many times in the attic of her house. Surprising her mother, Grace did not apply to teach in Burlington, but wrote Caroline Yale, principal of the Clarke School for the Deaf in Northampton, MA, to request a position in the teacher training class. The Yale family had introduced Grace to children with hearing impairment and thus Grace had the courage to contact Caroline, a Yale family member. Mrs. Goodhue agreed that Grace should teach in Northampton since this was a women’s town with Smith College dominating the social life. The career of teaching deaf children was a challenging one. Very few would seek out the oral method of teaching and look for such a serious occupation. Despite the fact that Grace only taught a few years, she was to make this her lifelong interest. Grace, herself, characterized her marriage to Calvin Coolidge, October 4, 1905, as uniting people of “ vastly different temperaments and tastes” and commented that her mother “was not in her usual good health” on their wedding day. Actually Mrs. Goodhue opposed the timing of the marriage since she wanted the couple to wait until Grace could learn to bake bread. This was a home wedding with only relatives and a few friends. However the Daily Hampshire Gazette of Northampton at the time called the groom “one of the best known young lawyers of Northampton” and “prominent in Republican politics” so his impact on that Massachusetts city was already noted. 1906 soon after they moved into their two family house. However, as Calvin climbed the political ladder in state politics, Grace was left alone to raise a baby and be a homemaker while Calvin left for the week in Boston. She wondered, “I marvel at the father’s confidence in my ability to cope with the problem.” They also rather quickly added a second son, Calvin, Jr. on April 13, 1908, to the family so she had two boys to raise. She looked to the pastor of her church for help in raising the boys. (This set a pattern for at the White House, the assistant physician to the president, would once again be an older brother for the boys.) Grace was the one who laid out the train tracks and built the sport roadster with son John, not father Calvin. Grace was concerned that her husband favored the younger son over the older one. 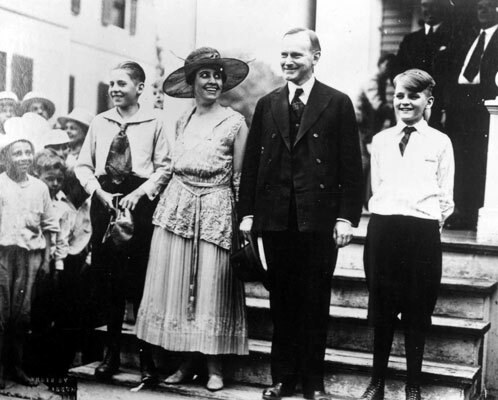 Father Calvin Coolidge had a “strong bond” with his second son, “who bore a strong resemblance to the mother whom he had lost in boyhood.” This meant that his relationship with son John was strained and would become more so over the years. Five year old Calvin Junior had an operation for empyema to repair an infected lung and both parents hovered over this more frail son. Grace’s fraternity, Pi Beta Phi, was a wonderful social outlet for Grace. She went to conventions and, in 1909 was president of the Western Massachusetts Alumnae Club. She traveled with her “sisters” to Berkeley, California in 1915 for the national biennial convention. She enjoyed the social events and parties, but this was abruptly interrupted with a telegram from Calvin announcing his race for Lieutenant Governor. She did not finish the tour of California sights, but took the next train home. Fortunately she returned to the East Coast since, her mother needed nursing and assistance back in Burlington. However, before Grace left California, she and her fraternity sisters vowed to write round robin letters not knowing that future historians would use these to gain insight into their lives and interests. Political officials were not well paid in the early 1900’s, so Calvin Coolidge borrowed funds from his father and tightened his budget to support his family. However, he did not want to be beholden to anyone. As his political trajectory escalated, Frank Waterman Stearns, his political backer, offered the couple a house on Beacon Hill when Calvin was elected governor. They turned it down with Grace remaining in Northampton with the boys and Calvin taking on an extra room at Adams House in Boston where he stayed during the week. They had no car; Calvin took the train and public transportation to social affairs. Grace did hire a housekeeper. Cal also liked to buy hats for himself and Grace; buying clothes for Grace was his one extravagance. The governorship could have been the pinnacle of Calvin’s career, but the Boston Police Strike made him well known for his stand on law and order and he was then a possible candidate for the Republicans’ national ticket in 1920. With Calvin’s strong stand against the strikers who had left the city of Boston without police protection, he thought this would be the end of his career. He had done his duty to call out the state militia, but probably alienated union supporters everywhere. Instead, newspaper headlines heralded words from his telegram to the A. F. of L. Union President, Samuel Gompers, “There is no right to strike against the public safety by anybody, anywhere, any time.” Coolidge’s name became popular in Republican political circles; Mr. Stearns printed up the governor’s speeches in a small book entitled “Have Faith in Massachusetts” and these were distributed at the Chicago Republican convention. After Warren Harding was chosen to be the presidential nominee by Republican political bosses in smoke-filled rooms, an Oregon representative nominated Coolidge for Vice President and he won in a popular upsurge among the delegates. 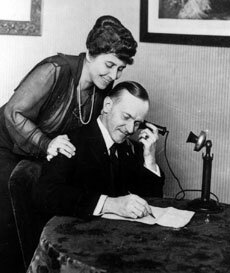 Coolidge was phoned when he was at Adams House with Grace. She was surprised that he accepted. Summers are hot and humid in Washington,D.C. and it was common for political families to travel to cooler climates. Thus Calvin and Grace’s visit with his father, Col. John Coolidge, in August of 1923 while Warren and Florence Harding toured the West Coast was not so unusual. Trains and the new automobile made travel easier. Of course the dirt roads leading to Plymouth did not make it a travel destination. It was a farming community set apart by isolation and beauty. Calvin’s Autobiography described the trembling in his father’s voice as he climbed the stairs of the farmhouse to tell the couple of the night’s passing of President Warren Harding. After praying, they went to the parlor and Grace brought in an oil lamp so they could decide their actions. Calvin wrote a telegram to Mrs. Harding. Then Vermont Congressman Porter Dale of Island Pond drove up and encouraged an immediate oath so that the Vice President could become President as soon as possible. Calvin turned to his father, a notary public, as the official in the room with the power to do this. Grace placed the family Bible on the table, Secretary Erwin Geisser typed up three copies of the official oath of office and at 2:47 a.m. on August 3rd,1923 Calvin Coolidge was sworn in as president. The young boys were not in the house. John, age 16, had just arrived at Ft. Devens in Ayer, MA to attend the Citizens’ Military Training Camp as a leading example for the nation’s boys. Calvin Jr. went to Northampton where he biked to work on a tobacco farm. Both learned the news of their father’s presidency and continued as if nothing had happened. As Grace and Cal prepared to leave Plymouth Notch, Vermont for Washington, D.C., Vermont neighbors lined up to shake their hands and wish them well. The Coolidges returned by train to Washington and gave Florence Harding time to pack up at the White House.They moved to the White House on August 21st. A role had been thrust upon Grace Coolidge and this affected her personally. This obviously was stressful as she tried to hold up her part of the job without really having substantial input. As a college educated woman with her ideas valued by many, this was a submissive position. However, the role of First Lady as greeter and cheerleader was her preferred role. She admitted to loving the interaction with people. Just as her father greeted people at his Burlington, Vermont church, she greeted them at the White House. She liked making people feel at home. That was her gift. During the changing times of the 1920’s Grace Coolidge continued the Hardings’ precedent of garden parties and musical gatherings. In 1925, the State Department was charged with formal entertaining and that relieved some of the pressure on Mrs. Coolidge and her personal secretary. Grace revived many White House traditions and added a few as well. The Coolidges were the first couple to light the community Christmas tree by pushing a button to activate the lights on the tree; electricity was a new invention at the time. Mrs. Coolidge, a church singer, invited carolers to the White House and decorated a tree with the boys. Sounds of children at play during the Easter egg-rolling were a joy to Grace. She truly loved children and animals. She showed off her raccoon, Rebecca, for the children to admire. When the raccoon was too rambunctious for the White House, Grace thought a mate would settle her down. Reuben was recuited, but both raccoons did have to go to the zoo at the end of this experiment. Both Calvin and Grace had animals in their houses from the days even before they had their own children, but no White House couple had such a variety of pets. Their dogs, birds, cats, and raccoons must have been the talk of the town. Renovation and restoration of the White House were very much on the mind of this very visual First Lady. She asked for a joint resolution by Congress to authorize acceptance of gifts of furniture for the stately White House. When she reached the White House in 1923, she was disappointed that authentic furniture from past occupants was not there. She had the building searched for valuable pieces and did find antiques in the attic. She and General Grant (grandson of U.S. Grant) asked for donations for the White House and Grant rescued some antiques from buildings where they had been stored. Engineers proposed a $500,000 renovation of the White House to secure the roof and attic and ceilings of the second story. Construction began in March of 1927 and the Coolidges vacated to 15 Dupont Circle to speed up the work. Mrs. Coolidge donned a hard hat to inspect the work one day and was pleased with the enlarged third floor and new sky parlor. This was part of the roof of the south portico and enabled one to have great views of the Washington Monument and Mall. The highpoint of the administration for Grace was the visit from her fraternity, the Pi Phi’s when they presented a portrait by Howard Chandler Christy to the White House of Grace in a red dress next to the president’s dog, Rob Roy. Her sorority sisters, 1300 strong, filled the White House with joy and pride. The low point was the death of her second son. Admiral Boone, the assistant White House physician, often played tennis with the boys on their vacations from Mercersburg Academy. Boone arrived one day for a game and found Calvin Jr. resting in a room with his mother watching over him. When Boone inquired as to the nature of Calvin’s illness, he tracked down an infection from a blister raised by playing tennis. This fast moving septicemia took the life of Calvin Jr. within a few days. Father Calvin, in his Autobiography, said that the “power and glory of the White House went with him.” Grace was very religious and believed that her son would be waiting for her in heaven. She even wrote a poem to this effect, “Open Door.” To lose your son in such a public arena must have been devastating. Some historians believe that Calvin, the president, became clinically depressed. Grace had to soldier on and also look to their other son, John, now at Amherst College. She also faced a whole term of four years in the White House and knew that many relied on her to perform her role well. Grace sought out people with disabilities to visit the White House. Helen Keller was a favorite. This interest in helping deaf children and individuals with disabilities was very strong and at the end of Calvin’s administration, $2 million was raised for the Clarke School for the Deaf. Her husband made her cause his cause. When wealthy friends asked how they could commemorate his years in Washington, he asked them to give to the Clarke School. No one is quite sure where Grace’s interest in baseball began, but it never ended. She was known as “The First Lady of Baseball.” “You may not give a hoot for baseball, but to me it is my very life,” she reportedly said to friends. The American League sent her a yearly pass in a gold trimmed purse. When Calvin did not choose to run again for president in 1928, they planned to retire to their two family house in Northampton. Lacking the privacy they needed, they bought The Beeches, a gated estate on Hampton Court in Northampton. Grace plunged into community service and writing articles. With Calvin’s sudden death of a coronary thrombosis in 1933, Grace filled her retirement with her precious four (son John, his wife, Florence, and their children, Cynthia and Lydia) and her many interests. Besides her local charity work for the Northampton Red Cross and her church, she raised funds in 1939 to bring refugee children to the U.S. from Germany and was Honorary Chair of the Northampton committee to raise money for the Queen Wilhelmina Fund for the Dutch victims of the Nazi invaders. She sold the Beeches, their retirement house, and built a new house, Road Forks, on Ward Avenue in Northampton. She loaned this house to the WAVES during World War II. In the 1950’s her health began to fail due to heart trouble. She lived quietly but stepped forward to dedicate the Coolidge Memorial Room at Forbes Library in Northampton and urged her son to give the homestead where Calvin was sworn in as president in Plymouth, Vermont to the State of Vermont to help preserve the legacy of her husband. She died at age 78 of kypho-scoliotic heart disease. The date was July 8, 1957. Grace Coolidge remains a popular presidential wife in the rankings of all First Ladies. This is probably due to her image as an elegant, young, and vibrant First Lady. The Secret Service nicknamed her “Sunshine.” The social side of the White House, under her guidance, exemplified tradition, such as her emphasis on holidays, and also included children and those with disabilities. Her interest in White House history was important in that she asked for a joint resolution by Congress to authorize acceptance of gifts of furniture. She wanted to restore antiques to the building and treat it as a living museum. She also improved the building by adding a sky parlor for more sunshine; she renovated the family quarters. She was a very modern woman; she hiked and swam. She loved baseball enough to attend games into the late innings of her own life. International in outlook, she raised funds for victims of World War II and loaned her house to the WAVES as their headquarters in Northampton. She wanted to help preserve the legacy of her husband. She gave materials and memorabilia to the Forbes Library, a public library in Northampton, and made plans to transfer the homestead, where Calvin Coolidge had been sworn in as president, to the State of Vermont.